Outer Banks Box Has New Owners! After a wonderfully exciting year and a half of business, and learning the ropes and nuances of running a subscription box company, Outer Banks Box is officially under new ownership! Over the past few months, Nina and I had been considering the effects of managing the business alongside our two full-time professions. 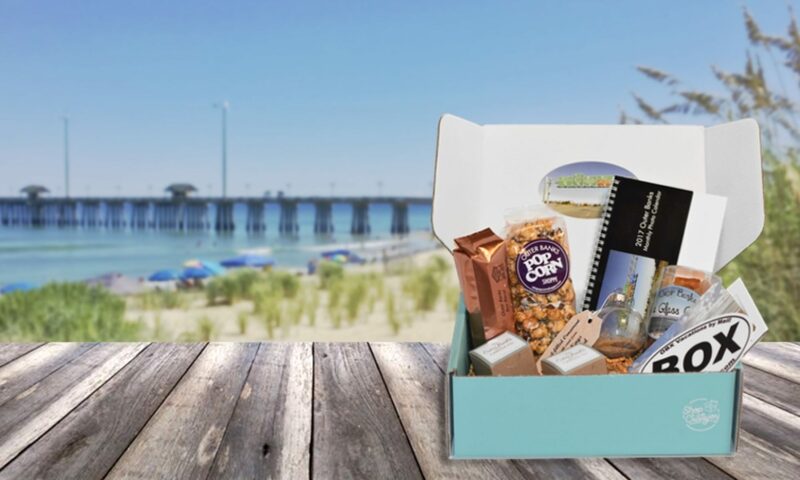 We knew that the potential of Outer Banks Box is so very great, but were developing a sense that we could not give the business all the time and nurturing it deserved. We wanted to find others with the passion for the Outer Banks who could take what we started and run even further with it! Over the course of the spring, we sought out and met with several local business owners who we felt qualified to manage what we started and interviewed them to ensure they’d treat our creation, customers, and local partners with the level of care and devotion we had committed to. 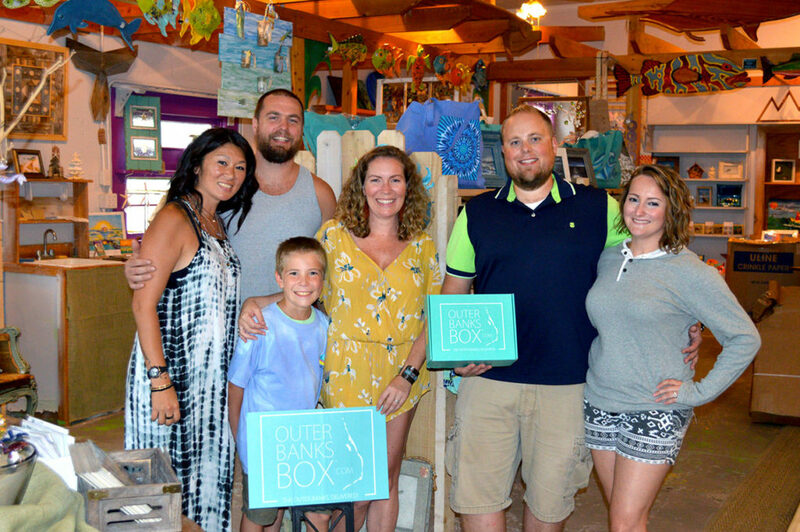 We’re happy to announce we found what we feel is a perfect match, and as of August 4th, 2018 Outer Banks Box is officially owned by the fabulous people at Muse Originals OBX! You may recognize them from their storefront on the beach road in Kitty Hawk, NC near Art’s Place, or perhaps some of their fantastic social media posts and OBX Made business spotlights. They aren’t your average local art and gift store… they really are something special with a distinctly fantastic vibe! Ami Hill, owner, is joined here with her family, Jonathan, Haley, Cooper, Griffin, and Penelope as well as Karen Brown, President of the Chamber, Sara Keener, Chamber and Richelle Barrett, CresCom Bank. Nina and I could not be more thrilled to have found such wonderful people with a clear dedication to sharing the best of the Outer Banks with the world. We know this transition will open the door for bigger and better things for the little business we started, and also allow us more precious time to spend with our families in the Pittsburgh, PA area. 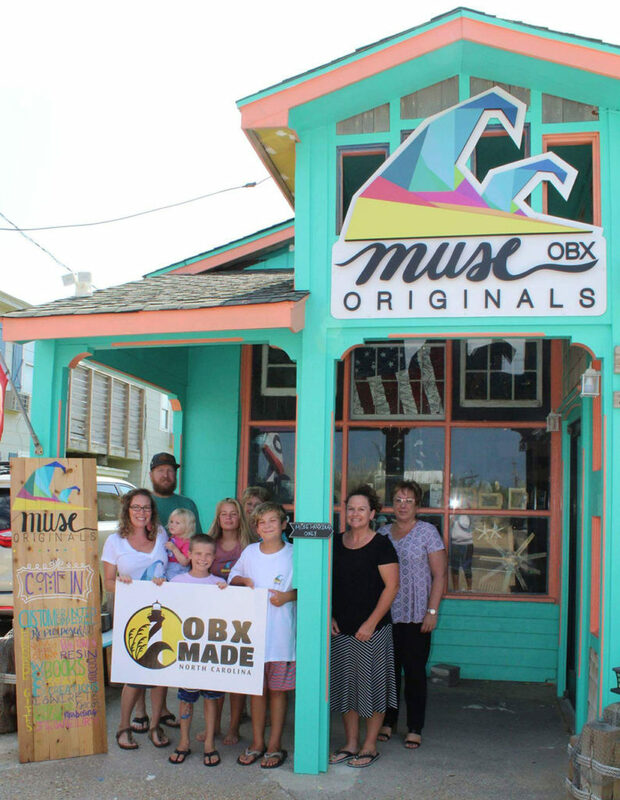 Ami has partnered with her Creative Director, Melissa Minkowski, at Muse Originals OBX and her computer genius and longboard surfing lover husband Joe to bring the Outer Banks Box under the Muse Originals OBX umbrella. We snapped this fun photo the day we transferred ownership to them, an exciting day for all! I want to personally thank each and every person who’s been a part of our Outer Banks Box journey. From the very first customers who waited online to sign up back on Thanksgiving morning in 2016, to Facebook fans and business partners giving us support every step of the way. Your photographs, feedback, and words of encouragement are something that we will never forget. It has been a pleasure sharing our little slice of heaven with you in that teal blue box… and we have faith you’ll be delighted for years to come.